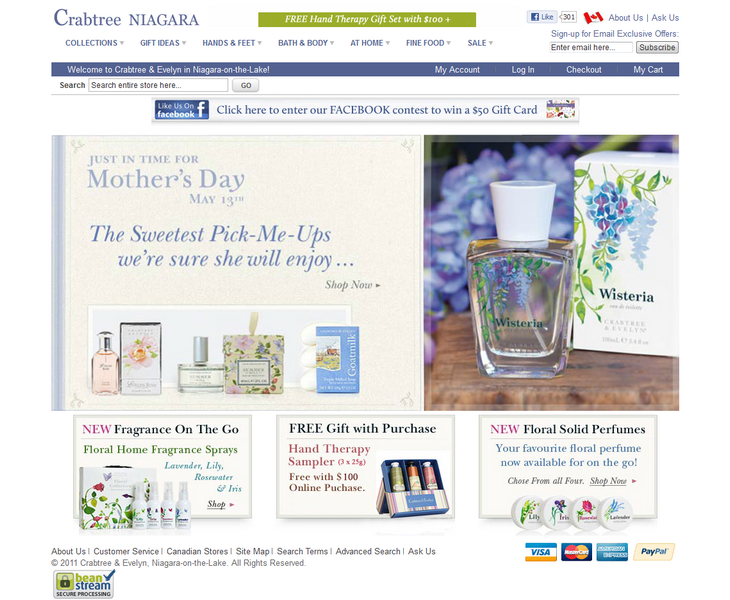 My today’s interviewee is Marilyn Francis – the owner of a Crabtree & Evelyn store in Niagara-on-the-Lake in Canada, which sells high quality bath & body products. She has found BelVG through the Magento Connect, and since that time we have done a pretty good work together. As far as she lives in Canada, I was worried of how we could manage to meet up for an interview due to 7 hours of time difference between us. It turned out we had no problems at all in contacting each other. In fact, I was impressed by her eagerness to explain things in details and give very profound answers. This is a chat we had with Marilyn Francis. M.F. Our website has been in operation for 5 years. It was first started using ZenCart, but as the business grew, my requirements expanded. I decided that a more flexible development platform that was SEO optimized was a better long term direction. After researching different options I decided on the Magento platform. I.T. What BelVG extensions are you using and do they have advantages, aiming specifically to your store? M.F. I first started working with BelVG by purchasing the Out of Stock Product Wait extension. This is a very useful feature, which paid for itself quickly by being able to let customers go on an email notification list if an item was temporarily out of stock. This feature not only helps produce orders, but it keeps customers informed about product availability, which improves overall customer service. The next module that I implemented was the Popup Cart extension, which again improves the transaction flow and allowed me to clean up my screen layout and put important information for the customer while shopping “above the fold”. We then moved to the Checkout extension. I was using the One Step Checkout module from another company and had problems with how it was functioning with my payment processing and shipping extensions. The BelVG team went ahead and worked some magic to get three third-party extensions working together! The third project was to use the Promotional Gifts extension, and again we customized it so that I am able to automatically add a specific gift to the customer’s cart based on a defined $ threshold, as well as having the option of setting up a promotion to let the customer pick from a selection of gifts. We also added a Facebook Like button to my homepage. Although I had a Facebook Like extension from another company that had been on my site for over a year, it was really ineffective in getting customer response. Perhaps, it is my customer base, but I found that my customers did not tend to respond to the Like button on my product page. When BelVG added a Like button to my homepage (instead of having it on my product pages), my Facebook “likes” doubled in less than 6 weeks. My next big project is to see what can be done to improve the speed of the site, so that my customers always have a great shopping experience. I want customers of all computer skill levels to easily navigate my site, find the products they want to buy and buy them without any difficulty. I.T. Do you use extensions of other development companies? M.F. I know that everyone says that the benefit of Magento is the availability of different extensions and in a perfect world they should all work together. But the world is not perfect. I am very pleased to have found a company like BelVG that not only has extensions, but also has the skills and interest in customizing extensions to meet specific needs. Other extensions that have been useful in general operations of my site are Google Analytics Dashboard, Zopim Chat, an interface to my Constant Contact email list and a slideshow feature for my homepage. I.T. What store functionality would you like to upgrade, but haven’t found the proper extension yet? M.F. I would like to have some better discounting options from the standard Magento. For instance, buy 2 and get a 3rd lowest item free or buy 1 and get another (lowest priced item) at 50% off. I would also like to be able to do an “add on sale” as a pop-up box. When customers reach a specific threshold, for example, they spend $50 they qualify for a special deal that lets them buy a product at a special price. I.T. Marilyn, it was my pleasure to talk to you! Wish you good luck on your business and many loyal clients ahead. M.F. Thanks, Irina! I want to add that I have been very pleased with all the work that BelVG has done. Many times you have not only done what I asked, but you also noticed what went wrong. If I was asking for something that was not a good technical idea, you kept me out of trouble and we were able to work out a better solution together. I would recommend BelVG company to any other store owners and I look forward to having a long working relationship with BelVG.